Robert Schnakenberg provides a humorous string of golden informational nuggets about the existence and philosophy of one of the world’s least understood and most fascinating weirdos. There’s a man I’ve been friends with since we were plucky young graduate students, and the foundation of our bromance is just basically that he is a really good dude. Let’s call him Jason because that’s his name. Jason has schlepped to the airport to pick me up on a holiday weekend and stood in for my actual brother when said brother couldn’t make it to my wedding. He's the type of guy your mind jumps to first when you get one phone call to scrounge up bail money, and although you may wake him up and he would know better than to participate in the shenanigans that landed you in the tank, he will gladly hit up the cash machine in the middle of the night and retrieve you from jail because maybe he feels bad about giving you the idea that got you into such trouble. Then he will tell the story of that night every time you see each other for years to come—charmingly and wittily, with precision and attention, because Jason can hold forth like none of your other friends and that is why he stands a cut above. He's a champion of grandiloquence and therefore you love him, though you sometimes disagree and often can’t get a word in edgewise. Robert Schnakenburg is also a man built on this model, and he’s written blessedly many interesting books on a wide variety of subjects including cocktails, the Supreme Court, William Shatner, insults, and DC Comics. He's good at profiling big personalities, rounding up amusingly irrelevant trivia, and giving recommendations based on his own opinion that show equal parts awareness of and disregard for the opinion of other critics. Like my buddy Jason, Schnakenberg is absolutely the guy you want to field at the last minute for the empty slot at your hypothetical “name ten living celebrities that you would like to invite to dinner” table. He’s not a celebrity, of course, but he’s personally the very best wingman you know: filled with enthusiasm for a cornucopia of nerdy fandoms, a proliferator of resonantly poetic discourse on delightfully trivial matters, and just generally a purveyor of excellent party tricks. You don’t mind introducing Schnakenberg to your friends; he always makes you look good. If fact, as soon as I’m finishing examining his most recent prose, I’m going to call up Jason and recommend Schnackenburg to him most highly. So we are beginning with this premise: that here is an author with whom we can firmly stand on matters of conversational style. Schnakenberg’s got the chops to befriend most anyone on the page, but I haven’t even yet told you the subject of his new book. I’m burying the lead: it’s Bill Murray! Yeah, I know—how great is that? Do you know how few books there are about Bill Murray’s life and work? Just one, Cinderella Story, written by Murray himself—an unreliable narrator if ever there was one. That’s why The Big Bad Book of Bill Murray: A Critical Appreciation of the World’s Finest Actor is the true jewel in Schnakenberg’s crown. Like his treatments of Shatner and Christopher Walken, this well-prepared book boldly attempts to go where no reasoning mortal has gone before, palatably organizing a string of golden informational nuggets about the existence and philosophy of one of the world’s least understood and most fascinating weirdos. Stupidly, I attempted to read this encyclopedic and messianic tome cover to cover. It’s only 272 pages, so just beginning at the first page and reading to the last page seems like a plausible approach. But don’t do it! This collection of Murray’s tricky and often brutal mystical wisdom has been curated in such a sage manner that to treat it linearly is to miss the experience of its real greatness. Like the bounce and wiggle of a conservation with Jason, you have to give it room to breathe. You have to let the book wrap around to repeating itself, thereby resulting in a natural emphasis on theme threaded throughout Murray’s life and work. You have to flip around between topics and stumble into something greater than the thing for which you were looking. You have to respect that once you’ve read the entry on Ghostbusters, you owe it to the author to stay tuned and read his subsequent entries on Ghostbusters II, Ghostbusters III, Ghostbusters: Hellbent, and Ghostbusters: The Video Game. The films are each ranked for overall quality, but they also have a “Murray rating” that judges “according to Murray’s performance and its importance within his cinematic oeuvre” (9). Schnakenberg could’ve used other words to say this—normal words like “classic” and “acting” or sycophantically complimentary ones like “canon” and “legacy”—but he goes with “cinematic oeuvre” because he is more amusing than normal people. You can flip around and read up on the films thanks to easy and unobtrusive chronological notations at the end of each entry. You can also flip through and just comb the highly philosophical Murray block quotes and look at the glossy photos, which are wonderfully chosen for their own artful composition as well as for their relevance to various entries in the book. You can also skip between the quick one-page anecdotes called “Tales from Murrayland” that don’t quiet lend themselves to a specific entry or heading, but that all clearly showcase the many facets of Murray’s oddity. Or you can find a few entries you like, then look up all the bolded red text within them, because those are also all entries in this surprisingly comprehensive work. There are miscellaneous one-off infographics throughout. Most of the entries are between one paragraph and one page long. I believe the longest entry in the collection belongs to Caddyshack, and that runs for about three and a half pages of text, four photos, one pull quote, one thumbnail film synopsis plus ratings, and 16 bolded red phrases indicating other entries. Plus there is a separate entry on “caddying”, which discusses Murray’s real-life experience on that subject. There are so many hilarious and amazing entries in this collection; there is no wrong place to start. There’s also no real way for me to explain to you my experience of flipping around in it. Even if I could, I wouldn’t want to spoil it for you. You had to have been there! That’s also pretty much what people say about Murray’s random party crashings and his edgy professional practices on set. To narrate what happened during a Murray event simply cannot do justice to what being in his presence must be like, unless, that is, your narrator is Schnakenberg. 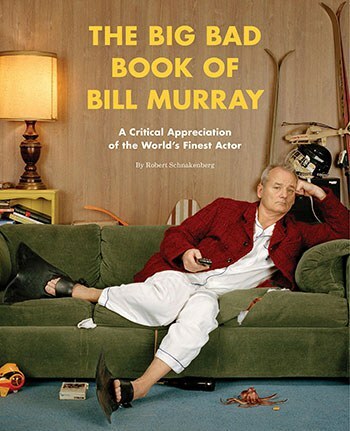 The Big Bad Book of Bill Murray is unquestionably as definitive as it gets. Read it to your friends at a party or read it by yourself in the bathroom. No matter how you approach Schnakenberg’s work, you will be both edified and regaled.